The Ballantine Family Fund serves the region of Southwest Colorado. While grants have been awarded outside this geographic area under unique circumstances, most funding is confined to supporting those nonprofits in La Plata, Dolores, Montezuma, Archuleta, and San Juan counties. All organizations applying to the Ballantine Family Fund must be a nonprofit, tax-exempt 501(c)(3) organization; or be a project or organization under the fiscal agency of a 501(c)(3) organization. Grant sizes are based on the size and need of the organization applying. Grants range in size from $500 to $5,000. An amount of about $250,000 is awarded annually. The Ballantine Family fund grants requests for general operations as well as specific projects and programs. Proposals must be submitted either prior to or on the deadline date. Applicants will receive notification of their grant’s status six to eight weeks after the application deadline. This six to eight week period allows time for the grants manager to review applications, reach out to nonprofits with questions regarding their application, and present the grants report to the trustees. Organizations may receive funding once per calendar year. 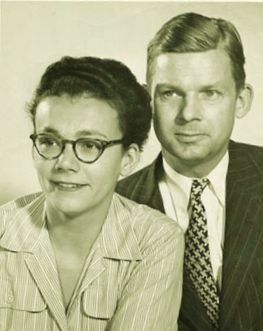 Arthur and Morley Ballantine. Photograph provided by: BCI.